IASIS PHARMA successfully participated as an exhibitor and for the third sequential year in CPhI Worldwide, the most important international pharmaceutical trade fair. For 2017, CPhI was held in the exhibition center “Frankfurt Messe”, at Frankfurt, Germany, from October 24th to 26th. During the exhibition, IASIS PHARMA team had the chance to share with the pharma professionals visiting our stand, information about the unique and wide portfolio of the company’s products. Increased interest was shown especially for nitrofurantoin range, the pharma grade effervescent tablets line, but also for mastihatherapy® caps. Nitrofurantoin, an antibacterial agent approved as a 1st line of therapy for Urinary Tract Infections (UTIs), was presented by IASIS PHARMA in three forms: 50mg & 100mg tabs, 50mg & 100mg capsules and 25mg/5ml oral suspension for pediatric use. To the best of our knowledge, IASIS PHARMA is one of the very few companies in the world, if not the only, manufacturing the full range of Nitrofurantoin formulation supported with updated Registration Dossiers, including a complete set of BE studies. The Effervescent line portfolio of products, pharma grade, is produced and packaged in the fully automated manufacturing site of IASIS PHARMA, completed in 2012 and continuously upgraded, in order to supply the Greek market but also the EU market with effervescent products of very high quality and efficacy. mastihatherapy® caps are distributed in pharmacies. Each capsule of mastihatherapy® caps contains 350 mg Pistacia lentiscus L varia. Chia (Chios Mastic) indicated for functional dyspepsia. In August 2015, Chios Mastic was approved by the European Medicines Agency (EMA) as a Traditional Herbal Medicine for the treatment of mild dyspeptic disorders. It also received a second indication for the treatment of skin inflammations & healing of skin lesions. 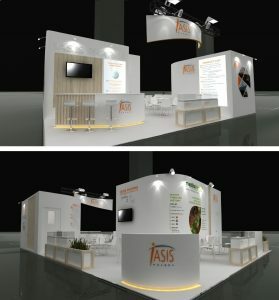 During the three day event, IASIS PHARMA management team had to opportunity to further strengthen relations with existing partners but also to hold fruitful discussions with several new potential business partners exploring further prospects of business cooperation thuis expanding the presence of IASIS PHARMA in more world markets. The next CPhI Worldwide meeting for 2018 is already set to take place in Madrid (IFEMA – Feria de Madrid), Spain and IASIS PHARMA is planning to have a strong presence for the fourth year in a row.